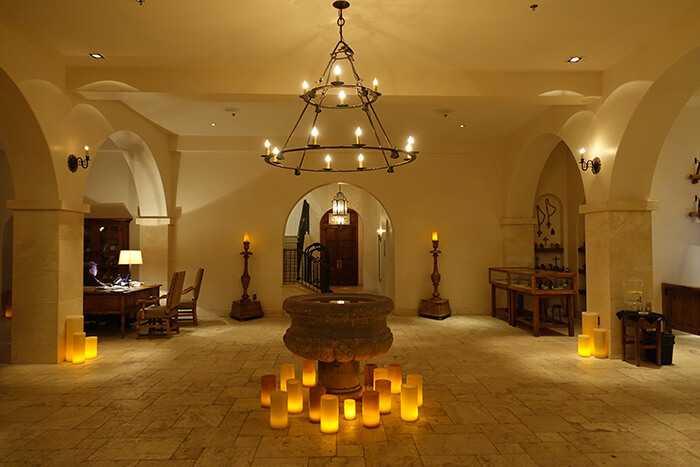 Named after the patron saint of Santa Fe, Hotel St. Francis is designed around the theme of a Franciscan monastery—and if you enter its lobby in the evening when the thick pillar candles are lit and the fireplace is flickering, it’s easy to feel the reflective and relaxing spirit of the place. 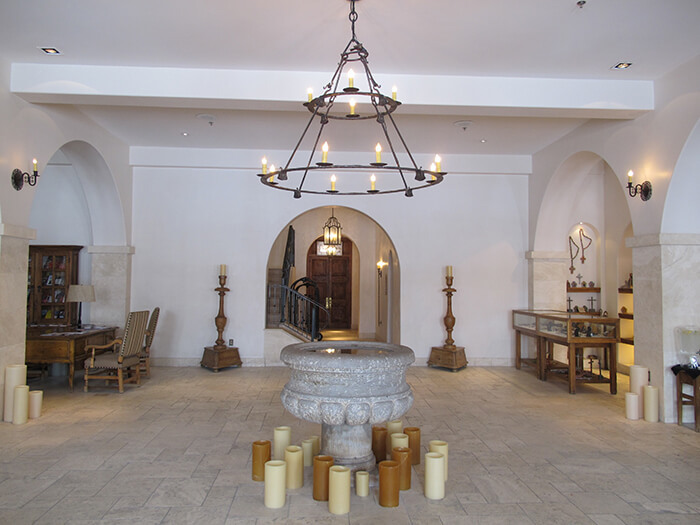 Come morning, however, some might feel the expansive stone floors and minimalist furnishings feel more sparse and more austere than transcendent and serene. The point being: this historic hotel is not going to appeal to everyone. 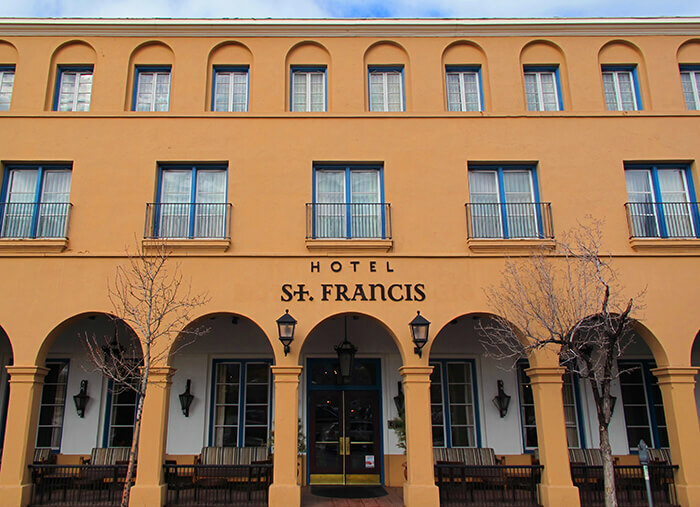 But since I enjoy a hotel that’s unique to its location and one that’s usually got a storied past (it’s also listed on the National Register of Historic Places), Hotel St. Francis did not disappoint. I also loved the three-story hotel’s location: just a block south of the Plaza. This means once you’re checked in, you can walk everywhere and not worry about a parking place when visiting the historic core of Santa Fe. With parking spots at a premium in this area, unfortunately, you still have to pay extra at the hotel for the privilege–but at least you are guaranteed a space. At check-in, the desk clerk was friendly and accommodating; she even handed my sister and I free bottles of water when we asked where we could find some to purchase. A concierge is on hand to help with dinner reservations, and offers helpful information about what to see and do in the area. Being it was “Restaurant Week” while we were there, she was another great resource. 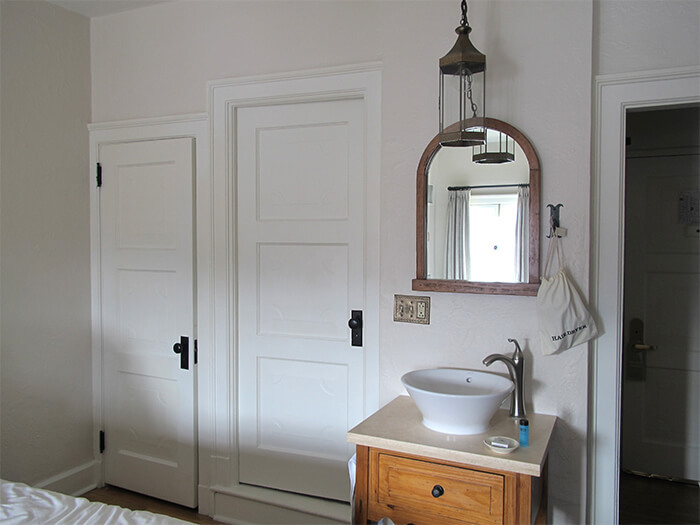 Because this is an historic building, the 80 guestrooms can vary in size and configuration; but they all feature handcrafted furniture and local art. 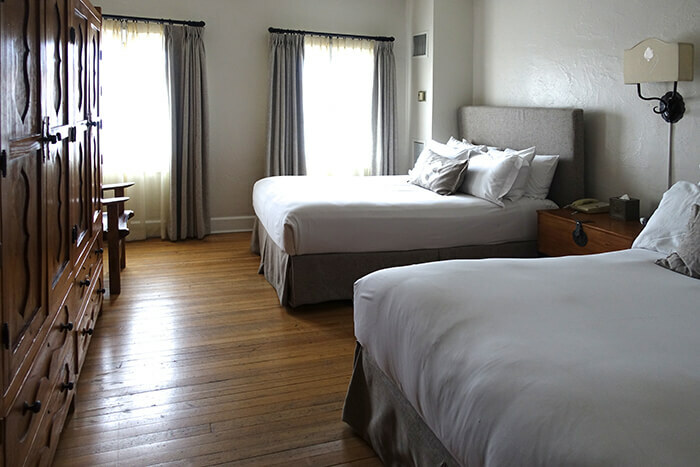 In our 3rd floor room (considered a Deluxe), in direct contrast to its hardwood floors, sparse décor and white walls were the wonderful comfortable beds (two doubles) –that seemed the focal and softening point: outfitted with fantastic Frette linens and hundreds of (it seemed like) pillows. The room also featured a small refrigerator, safe, steamer (instead of iron), flat-screen t.v., plus prerequisite hairdryer. Wi-fi is free. 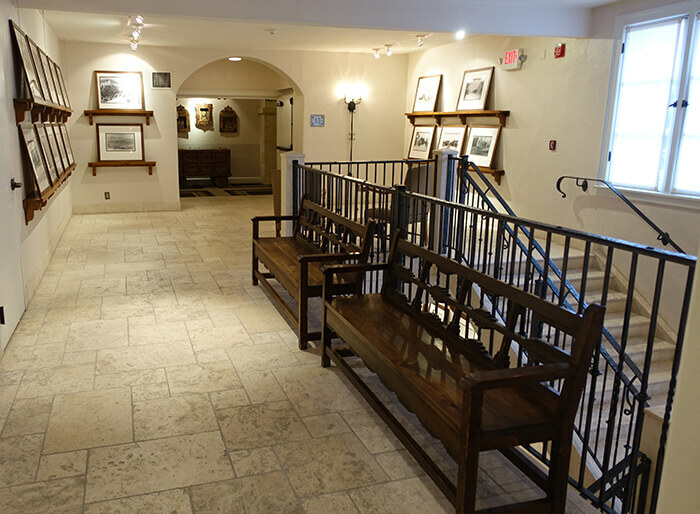 I also found it interesting just wandering the building—historical Santa Fe photographs are displayed on each of the stair landings—and it’s fun to see such back in the day photos. Like in 1924, when the hotel was known as the high class De Vargas—and bellhops only escorted guests to rooms after being shown their marriage license. No breakfast is served but with so many great places (like popular Café Pasqual’s) within walking distance, this is not an issue. 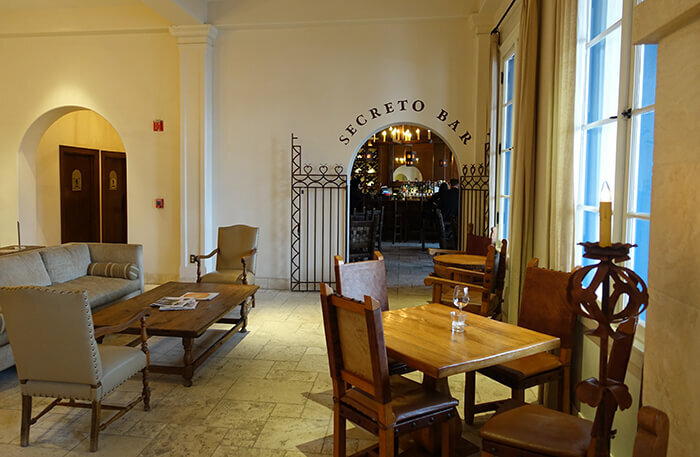 The hotel does have a fun and locally favorite bar, however–the Secreto Bar is tucked off to the side of the lobby. But be forewarned, if you are planning to stop in for happy hour, get there early for a seat. It’s worth it! 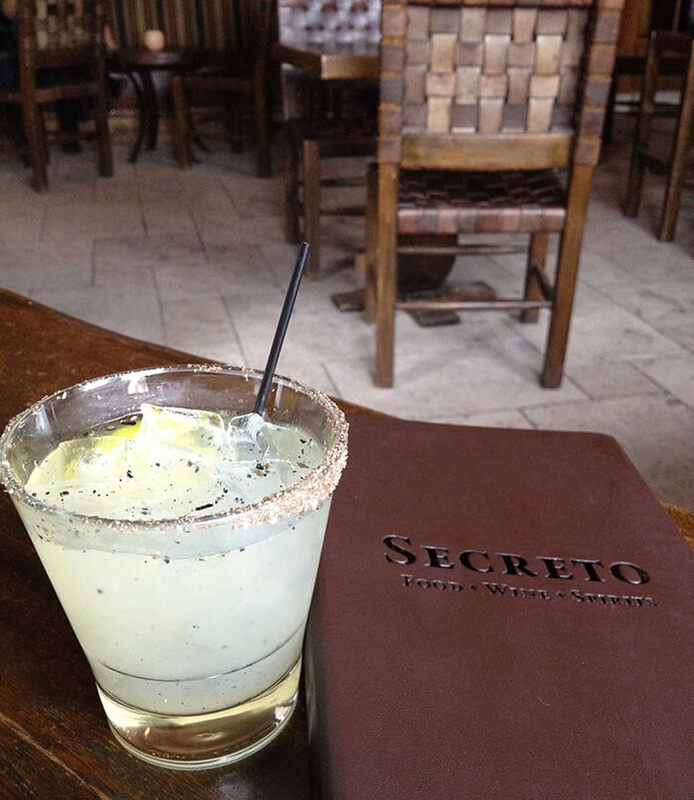 Tip: Try the Agave Way or the Smoked Sage Margarita. Room rates can start as low as $134 during the off-season. My Deluxe Double room was $174 plus a hefty parking rate of $18 a day. For more information, check the website. Compare rates and make a reservation through Hotels.com, Expedia or Travelocity as well. Review and photos by Donna Tabbert Long.